It is with great sadness that I am writing to let you know that I plan to leave Nottingham around February 2016. Before the big move I also plan on traveling abroad in December and January. This means that going forward BiTopia will need someone, or a few people, to keep it going. I’m letting people know early so if anyone wants to volunteer their time we have time to do a handover and work together for a while. What does running a group involve? buddy up with/promote other groups in the area, e.g. QT Notts, Notts Trans Hub. People can of course volunteer to do some of these things, or just what they want/are able to do. E.g. keep some form of regular meet up going, but not worry about the rest. How much time do I spend running BiTopia? During a week when nothing is happening, about an hour over the course of the week for things like tweeting, checking social media, and replying to emails. 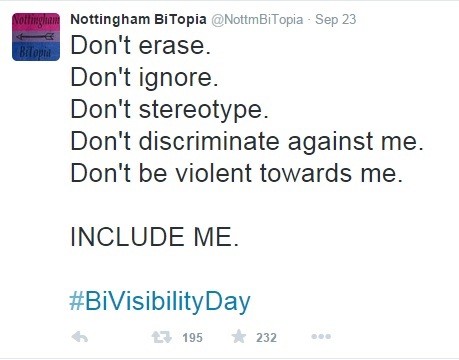 During the week with an event on, like Bi Visibility Day, about 8-10 hours over the course of the week which includes getting everything sorted and running the event. If anyone is interested, please let me know! If you want more info before making a decision, just let me know and we’ll have a chat about it. During the day I did a small bit of Bi activism on Twitter. That evening we had a wonderful turnout for the photos & speech at the Robin Hood Statue; many more people than I’d anticipated! The main bulk of the crowd were members of the LGBT+ Youth Group Outburst, as Jennifer (and friend) were going down to do a talk with them afterwards and their venue was just a few minutes away. Representatives from the police, Unison, and Nottingham University were also there along with members from a few different local LGBT+ groups. 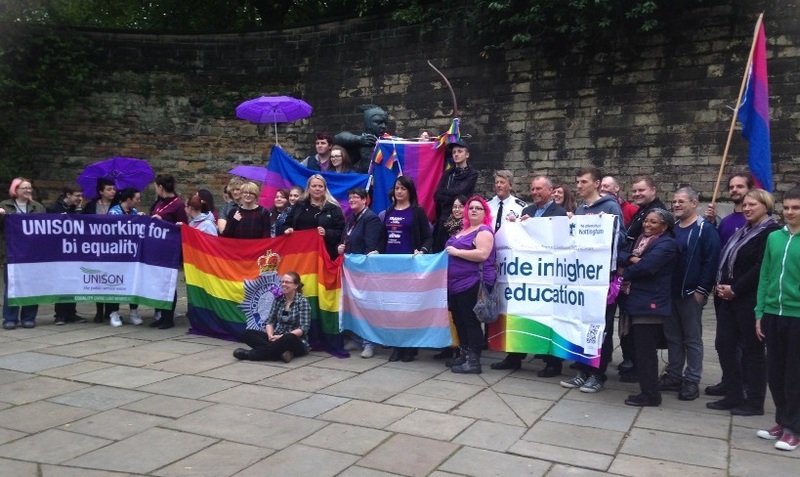 The photo shows about 30 people, holding purple umbrellas, bi and trans flags, and banners from Unison, the police and the Uni of Nottingham. The crowd surrounds a statue of Robin Hood with an arrow in his bow, about to fire. 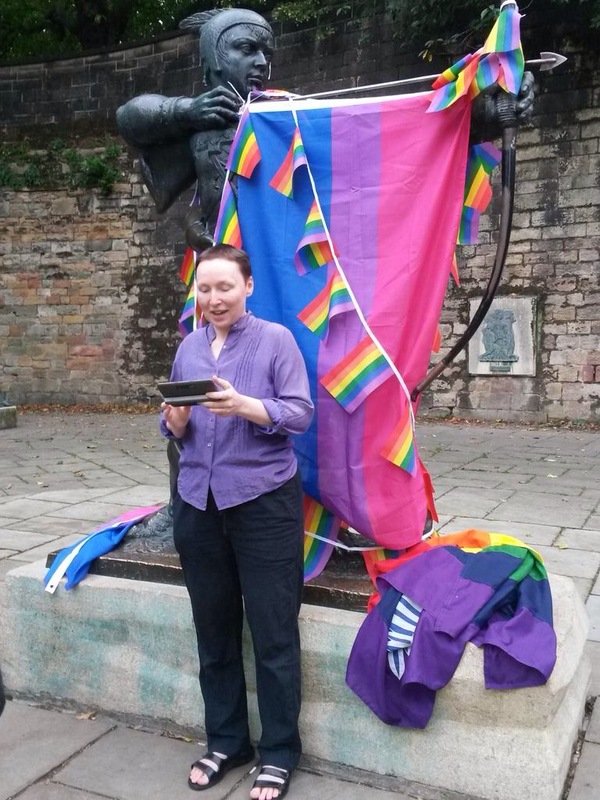 The statue has been decorated with rainbow bunting and a bi flag. I also got my photo taken with the representatives from the police. The uniformed officer present was actually the person whose image is used on the cardboard cut outs of policemen stood in shops in order to prevent shoplifting. It kind of felt like having a minor local celebrity present which was rather exciting. I enjoyed it when he put his hat on my head! The photo captures the moment just before the intended shot is taken. 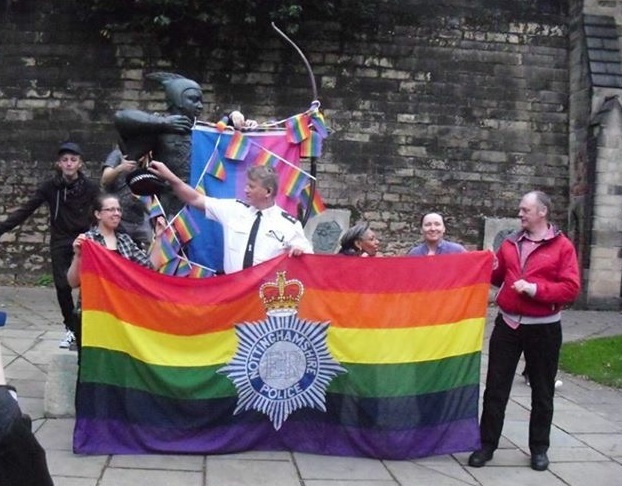 Five people stand behind a rainbow flag with the Notts Police logo on, not quite ready for the camera. Some are looking at each other rather than the lens. A policeman in uniform is putting his hat on the woman next to him. After the photos had been taken Jennifer gave a wonderful short speech about Bi Visibility Day and I handed out some cake. Once we had packed everything up Jennifer went over to Outburst whilst I headed up to the Friends’ Meeting House for the second event of the evening. 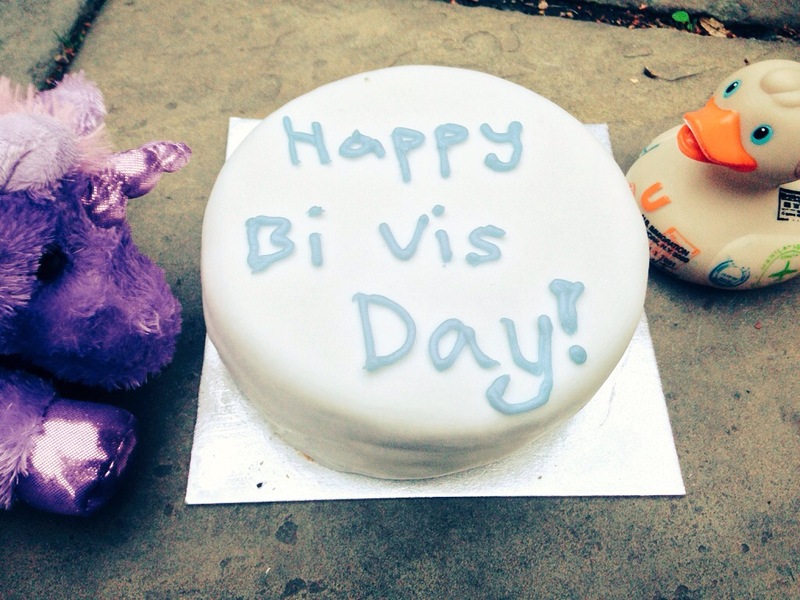 The photo shows a cake covered in white icing, with the words “Happy Bis Day!” iced in blue on top. A purple unicorn soft toy and a rubber duck sit next to the cake, looking happy as if they are about to take a bite! We had a nice, quiet social at The Friends’ Meeting House with some interesting discussions taking place. Jennifer and her friend (sorry I’ve forgetton their name!) arrived later in the evening and said everything at Outburst had gone well. As usual for BiTopia events, somewhere between a quarter to a third of the people there were first time attendees. I was happy to note that they seemed to get a lot out of coming along, and two of them have since been to our monthly pub social. I was really happy with how well everything turned out, and I had a really great evening.